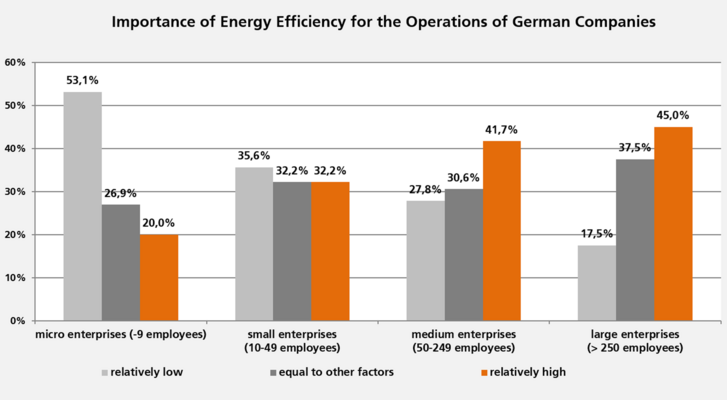 The energy efficiency index of the German industry by the Institute for Energy Efficiency in Production (EEP) allows well-informed energy efficiency related investment decisions and strategies and reflects businesses' perception regarding energy efficiency. With its sub-indices 'importance', 'investment' and 'energy productivity', the index also allows specific comparisons across 28 economic sectors. Further, participating companies benefit from a sector-specific benchmark. Applying this systematic on more countries, such as the G20 and Europe prepares ground to objectively assess, inform and accompany efforts to accelerate the level of energy efficiency as a whole - an approach EEP looks into with its international partners. Considerably more than half of the small and micro businesses surveyed expressed that energy efficiency is only of little relevance or at best as important as other factors. This is very different for midsized and large companies: over 40% indicated that energy efficiency is of comparatively high relevance. This is mirrored in the investment behavior of the over 300 participating companies in the index' winter data collection. Large companies, on average, invest a higher share of their overall investments into energy efficiency measures than smaller companies. If the overall circumstances are right, all companies tackle more energy efficiency measures. The results of the current study indicate that target-group oriented strategies are essential: Small and large businesses need to be addressed differently to drive energy efficiency. 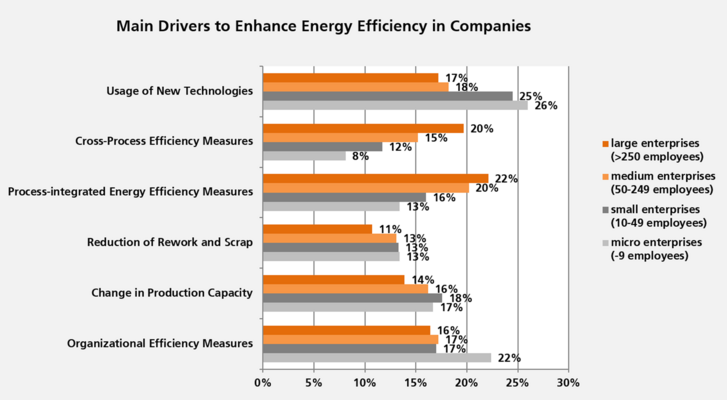 Small companies consider the introduction of new technologies and organizational measures as an opportunity for improving their energy efficiency, whereas larger companies are aiming more at process-related measures. Buildings are often considered being the key to a low carbon future. Looking closely, industry accounts for nearly as much energy intake whilst offering potentials to utilize waste energy and material. Considering that businesses regularly make purchasing decisions, the key is to find ways to encourage and enable them to effectively tap into the potential of improving energy performance and resource efficiency of industry, notably the producing industries. EEP, together with the University of Linköping and EEIP have identified that lacking comparable performance data is the key to gain general knowledge on energy end use, energy efficiency measures, and on actual levels of energy efficiency of production as well as support processes. We need to be able to describe actual energy efficiency potentials and how to lift them through policy, entrepreneurial and financial interventions more and more accurately to be able to compare performance of sectors across geographies rather than accumulated country data. This reduces unknowns, risks & uncertainty in relation to energy efficiency interventions, and enables sector-specific cross-country analyses. It equips companies and legislators with insights on how and where to act, and makes financial institutions & service providers aware of feasible projects and required funding mechanisms and services. Following these objectives, we are developing the 'Energy Efficiency Index of the Industry', initially focusing on the G20 countries and Europe, to stimulate a positive race to the top amongst industries towards a low carbon future. For further information, to become partner in this effort or to participate and benefit from the index please contact stefan.buettner@eep.uni-stuttgart.de respectively visit: eep.uni-stuttgart.de/eeei/. In collaboration with Fraunhofer IPA, the German Energy Agency (dena), TÜV Rheinland and the Federation of German Industries (BDI).